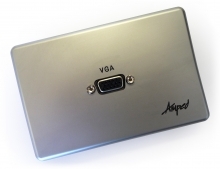 Amped Slimline VGA (Brushed Aluminium Wall Plate) + FREE SHIPPING! VGA was the in-thing not so long ago, we probably all have some legacy tech sitting around that's just aching to be taken out of storage and used again. A perfect example is your great old CRT monitor. Those things are still the best way to enjoy old-school PC gaming, because they can handle most resolutions between 320x240 up to 1600x1200 and beyond without a single visual artifact or dodgy pixel. And now, thanks to this top-of-the-line Amped Slimline VGA (Brushed Aluminium Wall Plate), you can hook it up in a convenience location of your choice and get some game on, or plug in any other VGA-compatible device you may want to integrate into your media centre. The premium-quality nickel-silver plated contacts ensure long-lasting, high-quality signal transmissions, and are also female-to-female, meaning you'll never have to solder or hand-wire your systems up ever again. Just grab your required length of pre-terminated male-to-male cabling and you're ready to plug and play. The 4mm thick faceplate will also blend seamlessly with your current setup, and is easy to install, coming with the templates and screws you need for a rapid set up. Designed specifically for Australian houses the Amped Slimline™ series is the Australian choice for premium high performance cables and connectors. Featuring precision engineering the Amped™ series offers quality equal to Belkin, PureAV, Sony & Monster Cables!